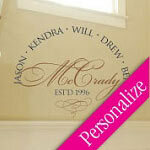 One of our best selling wall decals, the Fancy Family Names design will jazz up your entryway, dining room or family area in a snap. 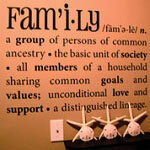 This custom family sticker is easy to apply & easy to remove when you want to change up your decor or need to move. 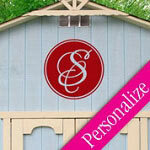 A beautifully elegant way to personalize your entryway or family room with personalized vinyl wall art. We'll customize it any way you want - even substitute the first names for a short phrase if your family is still growing. 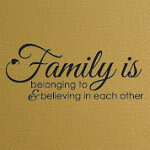 The family wall art stickers are removable but not reusable, we use a thin matte removable non-toxic vinyl material that allows the texture of your wall to show through and appear painted on the wall. If you need a size other than we have listed above, please contact us — all of our products are cut to order, therefore 100% customizable. 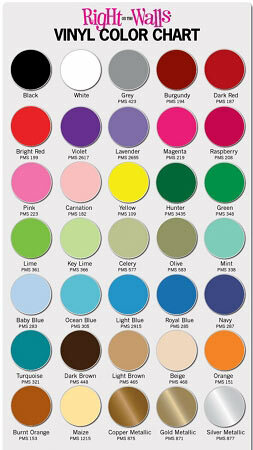 Main Vinyl Color: Choose Foreground Color for The Surname Family & Date. You may substitute a short phrase instead of first names if preferred. Actual measured height of your custom made piece will vary based on the personalized information provided. Our decals are removable but not reusable, we use a thin matte removable non-toxic vinyl wall art material that allows the texture of your surface to show through and appear painted on any smooth surface that you apply them to. Easy to apply & easy to remove when you want to change up your decor, or need to move. If you need a size or quantity other than we have listed above, please contact us — all of our products are cut to order, therefore 100% customizable. 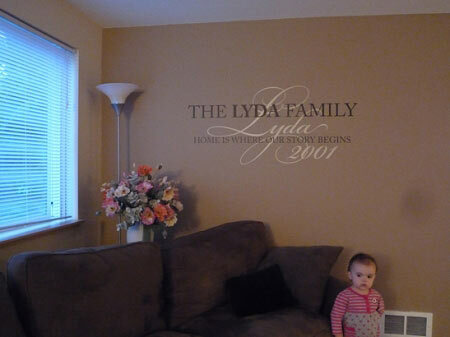 Our wall decals are removable but not reusable, we use a non-toxic vinyl material that allows the texture of your wall to show through and appear painted on the wall. The item is gorgeous! I love it. There was a slight issue with initial shipment not being exactly as depicted. I sent an e-mail and the issue was resolved in a flash. I would not hesitate to order from this vendor again! I love this decal, the personalization and the look of real painted letters really amazed me. Thanks for a great product. This piece totally MADE my whole room. It is the best decor I purchased, ever! I love the personalization and everyone who sees it is blown away. Thank you from one VERY happy customer who will be back for more!!! 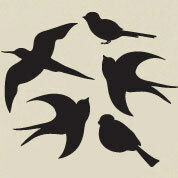 I ordered this decal with a short phrase instead of names - we're not through growing our family yet. 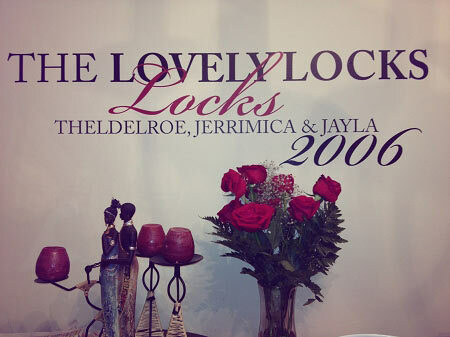 I love that it is so personalized and it looks great in our entryway. We receive many compliments on it & it will be a part of our home forever. Thank you. Thanks for your awesome products and service!